Knowing the five basic “mother sauces” is as helpful to the food lover as it is to the chef. Understanding these sauces will help you read menus, decide what to order, and determine what wines might pair best with your meal. For cooks and chefs alike, learning to make the five mother sauces is a basic skill that will open up a world of culinary possibilities. 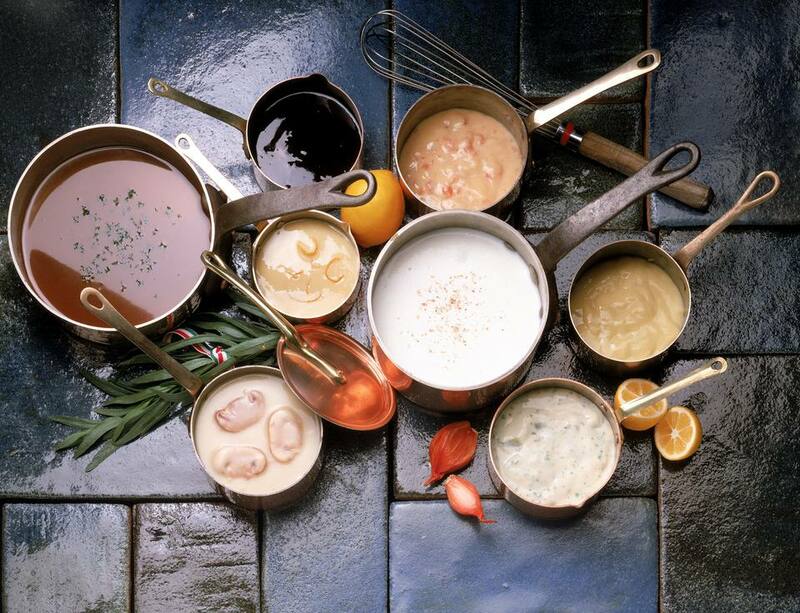 The five mother sauces (béchamel, espagnole, hollandaise, tomato, and veloute) differ based on their main ingredient and thickening agent. Although the five mother sauces are usually not consumed in their original state, they can be made into many secondary sauces by adding herbs, spices, or other ingredients. While the basic sauces are not overly complicated, their recipes are specific and may take some trial and error to get them right. Once you know how to make the mother sauces, you have a useful skill that will allow you to create so many tasty flavor combinations. Use these descriptions of each mother sauce and the examples of their common secondary sauces to learn more and decide which to make first. Bechamel sauce, also known as white sauce, uses milk as a base and is thickened with a white roux. Bechamel sauces are commonly flavored with onion, shallots, pepper, or nutmeg. Secondary sauces that are made with béchamel include cheese sauces, cream sauces, or Mornay sauce. Bechamel based sauces are often served with pasta, vegetables, eggs, or poultry. Espagnole is often referred to as brown sauce. It uses a brown stock, such as beef, as a base and is thickened with a brown roux. Espagnole is often flavored with aromatics, savory herbs, or tomato paste. Espagnole is commonly made into secondary sauces such as mushroom sauce, demi-glace, sauce Madeira, or Bordelaise. Espagnole sauces are commonly served with roasted meats, such as beef, veal, lamb, or duck. Hollandaise sauce is a rich creamy sauce that uses butter as a base and is thickened through the science of emulsions. Hollandaise sauces are often flavored with peppercorns, cayenne, lemon, or vinegar and can be made into secondary sauces such as maltaise, mousseline, or bearnaise. Hollandaise sauces are often served with eggs, vegetables, or poultry. Red sauces have a tomato base and are thickened with purees, by reduction, or a roux. Red sauces can be flavored with mirepoix, meat stock, or salted pork. Secondary sauces commonly made from red sauce include puttanesca, Creole, or Spanish sauce. Red sauces are very versatile and can be served with nearly everything, including pasta, vegetables, fish, beef, veal, poultry, or polenta. Veloute sauces use chicken, fish, or another white stock as a base and are thickened either with a roux or a liaison (egg yolk and cream). Examples of secondary sauces made with a veloute include mushroom sauces, curries, herb sauces, or white wine sauce. Veloute sauces are often served with lighter dishes such as vegetables, fish, pasta, or poultry.